« Hey Cam! Wanna Beat the Steelers? SPREAD THEM OUT! 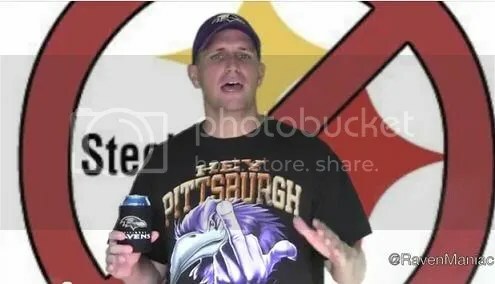 Just like the Ravens don’t get any “warm-up” games this year, clashing with the division rival Steelers right off the bat, Goob is ready for NFL Kickoff Weekend and is in mid-season hating form as he rails against Pittsburgh fans. Great way to kick off the new season! This entry was posted on September 6, 2011 at 8:26 am and is filed under Goob's Videos, Hating, Humor, Ravens. You can follow any responses to this entry through the RSS 2.0 feed. You can skip to the end and leave a response. Pinging is currently not allowed. 1.) You meant to pronounce and spell the word “aversion” in your definition segment. Not the word “adversion”, which is not really a word. Too many f-bombs for me not to be a di*k about something. 2.) You mention Pittsburgh’s population as ranking it as 59th among American cities. However, as you know, people from an area do not necessarily live inside of city limits. As such, the indicator of population is actually market size, of which Pittsburgh is 24th in the country. Or two spots ahead of Baltimore. 3.) There is certainly elements of truth in your statement that there are many “bandwagon” Steeler fans. That comes with the territory of putting a consistent winner on the field for 20 years. Many of these exist in other cities where the person has no connection to Pittsburgh or the team. They are annoying but there are not as many as you think. 4.) In fact, the simple fact is that Pittsburgh simply bleeds black and gold. The local TV ratings are consistenly #1 in the US. The waiting list for season tickets is 30 years long. When people leave Pittsburgh they take the rapid fandom with them to other areas. There are not more transplanted Pittsburgers in Charlotte, Raleigh, DC, etc than other cities/areas. It is simply that the Steeler pride runs far deeper than in other areas of the country, and it transcends earthly confines like distance and geography. In 23 years, I have only missed three live Steelers games. One because of work, and two because of flights for my honeymoon. That’s passion. When the Ravens exist for 23 years, let me know. 5.) Speaking of bandwagon (in other words how sports teams get fans), I recall days not too long ago in which the seats at Baltimore’s stadium were either vacant or filled with Steelers fans. When a team starts to win, more people come. I don’t think you want those “more recent” fans to stay home Sunday. 6.) Re: Steely McBeem. Couldn’t agree more. When people leave Pittsburgh they take the rapid fandom with them to other areas. You meant to say rabid. While, unlike “adversion” it is an actual word, YOU WRONG. Or maybe you did mean rapid. Seems possible that many of these bandwagon jumpers indeed rapidly became Steelers fans because that’s the cool thing to do. Not as many as we think? Please. Just trying to keep it interesting. And you’re welcome for the extra site hits!